Breeze FM has received a number of awards in recognition of its work and that of its staff. Certificates of Membership in Life – Saving Partnership by the Ministry of Health in appreciation for the support provided towards the national measles campaign for children. The Media Institute of Southern Africa (MISA) – Zambian Chapter Electronic Media Award for 2004 in recognition of Breeze FM’s contribution to the development of electronic media in Zambia. Breeze FM Staffer, Greyson Mwale awarded the MISA-Zambia Freedom Award for Broadcasting for being the most outstanding Broadcaster. Department of Cultural Affairs Best Media Production for Cultural Programmes. Breeze FM staffer George Luanja awarded the Most Consistent Cultural Producer Prize by the Department of Cultural Affairs. The 2010 Sports in Action Outstanding Developmental Media Coverage Award. 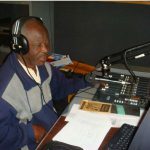 The 2010 MISA – Zambia ‘Mildred Mpundu’ HIV/AIDS Community Media Award. Thanks John. Take note that where ever you are, you can listen to Breeze FM online. Visit http://www.breezefmchipata.com.